High Performance Landscape Guidelines is the first document of its kind in the nation: a comprehensive, municipal design primer for sustainable parks and open space. The product of a unique partnership between the Parks Department and the Design Trust, a nonprofit organization that helped create sustainable guidelines for NYC buildings, High Performance Landscape Guidelines covers every aspect of creating sustainable parks, from design to construction to maintenance, and feature many best practices for managing soil, water, and vegetation resources. The Guidelines, running over 270 pages, cover site assessment; design, construction and maintenance; and soils, water and vegetation. the final section of the manual includes several case studies, including two of Brooklyn's Parks: Calvert Vaux and Canarsie Parks. Climate change threatens the stability and longevity of New York City’s infrastructure, buildings, and parks; it also compromises the health and safety of the city’s population. Unless the growth of greenhouse gas emissions is curbed and reversed, experts predict that climate change will result in significant sea level rise, increased storm intensity and frequency, and increased temperatures. Two factors will exacerbate the impacts of climate change in New York City: the urban heat island effect and the city’s overburdened stormwater infrastructure. 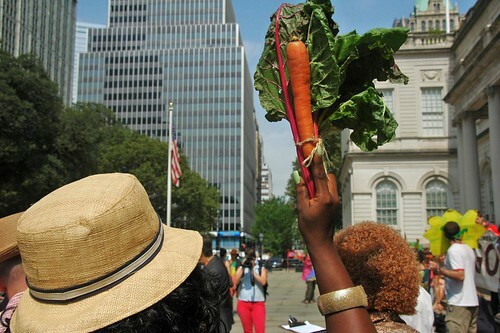 This photo of a community garden supporter in front of City Hall was one of my photos illustrating my 2010 guest rant on Garden Rant. Here's my review and recap of 2010. July 2010: I attend the Garden Bloggers Buffa10 meetup of garden bloggers. Fall 2010: I received my Citizen Tree Pruner's certification. According to Google Analytics, from which I've collected these stats, "unique page views" are the number of visits during which a page was viewed. Page views are higher, since the same page may be viewed multiple times during a single visit. Unique pageviews, however, doesn't distinguish multiple visits from the same person or IP address. Mulchfest 2011: Recycle Those Trees! 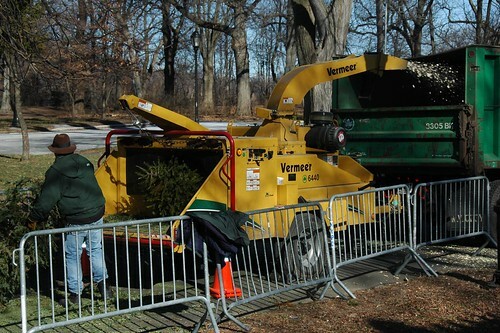 The giant tree shredder in action at last year's Mulchfest at Park Circle in Prospect Park. It's tree recycling season in New York City. Residents can have their trees recycled into mulch for the City's parks and gardens. Note that, although recycling pickup is still suspended after the post-Christmas blizzard, you can leave trees curbside for recycling pickup. Remove all lights, ornaments, tinsel and tree-stands from your tree. Leave your tree unwrapped. Don't put it in a plastic bag. Bring your tree 10am-2pm Saturday, January 8th or Sunday, January 9th to one of 70 locations citywide. Residents can also pick up free mulch at designated chipping locations. This year's Mulchfest locations for Brooklyn are almost the same as last year's. Those marked with an asterisk (*) are on-site chipping locations.